Give your accountants ease and convenience by tracking and archiving all outgoing payments. module allows you to quickly and easily process your payables. 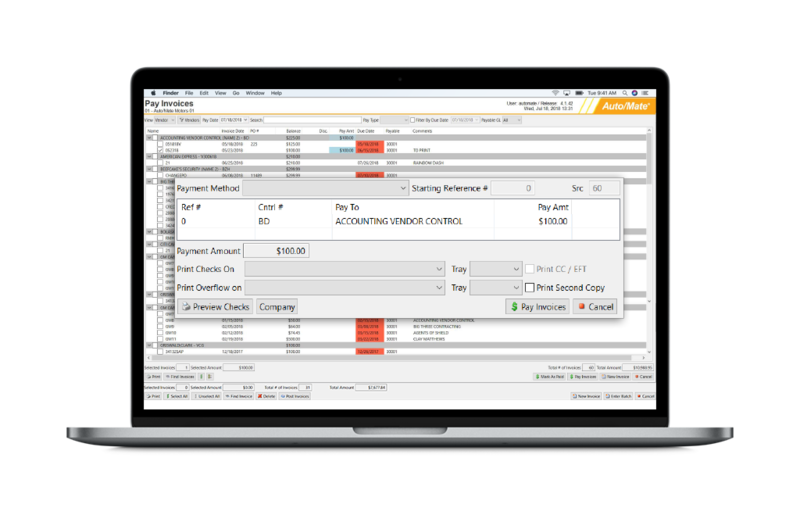 Create a single invoice at a time or perform a batch process of invoices. Accounts Payable handles single location or intercompany transactions with the capability to automatically set up the due to/from entries for other locations. 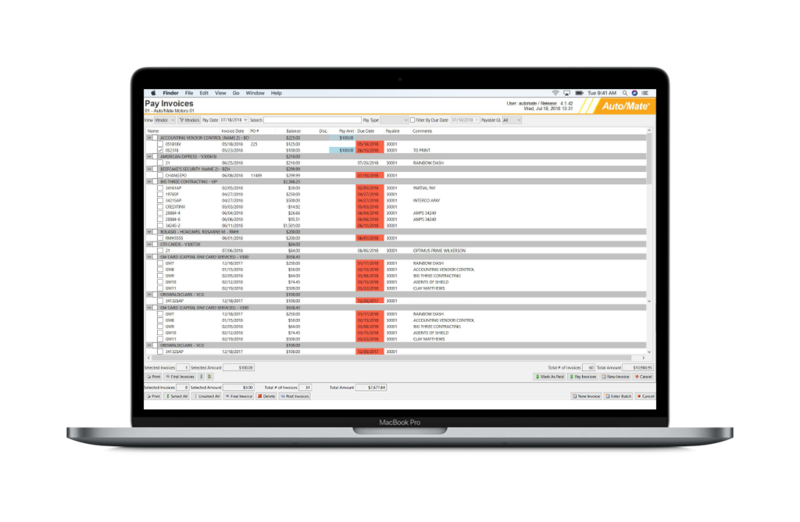 With the elimination of manually posting multiple company transactions, Auto/Mate users can save time and reconcile what each store owes the other with ease and accuracy. Eliminate the need to enter your credit card info every time you make a payment. You can save this info in the DMS. Quickly and easily pay your vendors with credit card advancements complete with all of the essential information. A few clicks, and you’re all set. Archive and track all transactions. Track all payable transactions and archive copies of the check with Doc/Mate™. 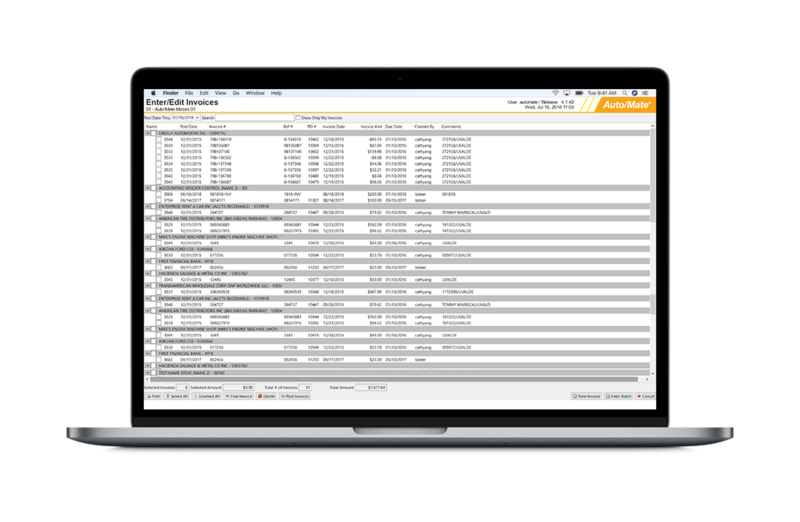 When issues arise, you can rest assured conveniently trace and reference the associated payment through powerful drill downs. Single or multiple store payables. Accounts Payable handles single location or intercompany transactions with the capability to automatically set up the due to/from entries for other locations. With the elimination of manually posting multiple company transactions, Auto/Mate users can save time and reconcile what each store owes the other with ease and accuracy. Pay vendors faster than ever with quick payments. Make one-time payments on the fly by easily searching for the recipient and selecting your payment method. You can also preview these quick payments before printing any checks you make out. With this ability, you can be sure you’re not wasting a bunch of paper and toner.